Desert Island Singles: “Eagle Rock” by Daddy Cool (1971) | Name-Brand Ketchup. ← Did you say “good morning” to your chair yet? At age 16 I tumbled on to this song on a Warner-Reprise sampler LP called “The Whole Burbank Catalog.” To say it rocked my world would be an understatement. The opening guitar riff grabbed onto my brain and wouldn’t let go. 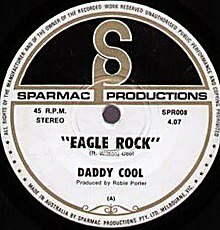 Later, I found out that Daddy Cool was the hottest band in Australia in the early 70s, and that “Eagle Rock” had the longest stay at #1 on the Aussie music charts as any song till then.